The icon loved the desert city, and the city pays homage to his musical legacy. 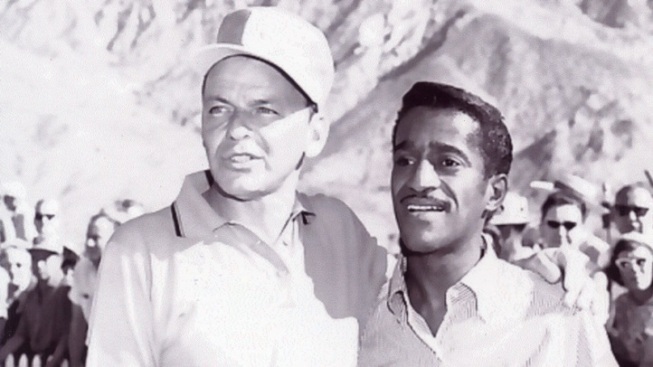 Frank Sinatra, pictured with Sammy Davis, Jr., loved Palm Springs. The city shows its affiliation with centennial celebrations marking the man and the legend. THE DOLLY SINATRA LODGE: The Order Sons of Italy in America gave their meeting house a moniker any fan'll know, that of Mr. Sinatra's mom Dolly. You can bet there'll be a bash there, just days ahead of Dec. 12, Mr. Sinatra's birthday proper. Pen Dec. 9 on your calendar, and make a date to savor "the food, song, and dance." The parties around town continue, with a Purple Room party on Thursday, Dec. 10 (AJ Lambert, Nancy Sinatra's daughter, will sing) and celebrations at Spencer's and the Colony Palms Hotel on the night of Saturday, Dec. 12. Lady Blue Eyes shall Sinatra-up Spencer's (Mr. Sinatra is described as being a "loyal patron" of the spot) and the Colony Palms will offer a Sinatra-themed birthday cocktail, in addition to other festive-making touches. Looking to honor the legacy in the location the singer once lived and played? Palm Springs is set to do it up with some crooning, some cocktailing, and lots of conviviality.